The White City of Peru, apparently named not only for the color of the buildings, but also because it was the city with the highest number of European immigrants. My two favorite parts of Arequipa were the queso helado and the incredible sunsets in the main square. Queso helado isn’t actually frozen cheese, but a delicious and yummy local ice cream. Arequipa is known for the Santa Catalina Monastery, which is basically a small city within the city. Wealthy Spanish sent their daughters to live there until they died, paying a monthly sum for their daily upkeep the rest of their lives. Each nun basically had their own apartment within the complex, but weren’t allowed contact with the outside world except in one small room. On the way to the canyon, there is a famous stopping point known as the Cruz del Condor where there are almost always Andean condors flying in the morning hours. This point is at the cross-section of winds and the condors ride them all morning scavenging for food. We saw quite a few before venturing on to start our trip into one of the deepest canyons in the world. This overnight hike into Colca Canyon involved a really, really long and really, really hot walk down into the canyon and a really, really steep hike out in the morning starting while there were still stars out. One thing I failed to capture on camera (sorry!) was my first introduction to cochineal bugs living on prickly pear cactus. Squishing them exudes a red dye that can be used to decorate skin and (if enough are harvested) color clothing. I’d seen these dried bugs in markets, but never actually seen them alive on cacti. 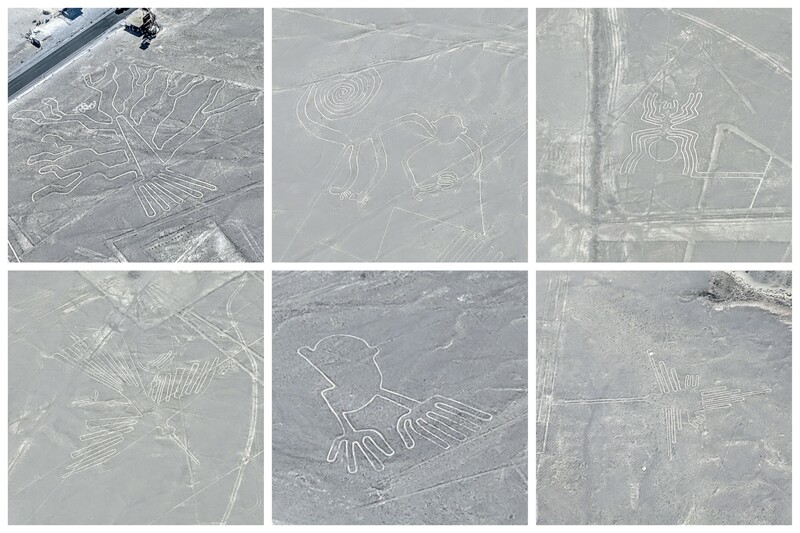 The only real way to see the Nasca Lines is to get up in a plane, so I paid the money and hopped aboard a little prop plane to see these beautiful creations. They were made by digging small trenches that removed the top layer of gravel and exposed the subsoil underneath which is lighter in color. Their cultural importance is still up for speculation and there are way more designs than the ones here. I don’t usually take photos of museum pieces, but the Museo Larco in Lima is a pretty exceptional museum. I find the patterns on Nasca (also written Nazca) pottery to be stunning, so I thought I’d share a few of the more spectacular pieces. This type of art was actually the inspiration for many modern and cubist artists of the 20th century. Other highlights included skulls that were opened up in Inca times. This brain surgery would have been performed to help hematomas or remove parts of the skull that had been fractured in war. The skull on the left doesn’t show any bone regrowth so the person probably died from the effort. However, the one on the right shows lots of growth so that person lived quite a while after the surgery was performed. Also on display were sculptures depicting cultural scenes, textiles covered in feathers, and rooms full of jewelry. Many rulers of early Peruvians wore giant earplugs as a symbol of status. Some of these are 3-4″ across, so you can imagine how large their earlobes had to be stretched to accommodate these works of art. This offer is still valid. 🙂If you want a postcard from overseas, fill out this postcard form! At some point this school year, I will send you a postcard from somewhere outside the United States.